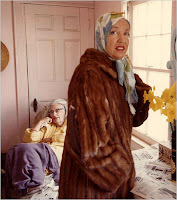 “Grey Gardens,” Albert and David Maysles’s 1975 documentary about an eccentric mother and daughter living in a dilapidated mansion on East Hampton, N.Y., has inspired plays, fashion collections and a dedicated following. A new movie about the two Edith Beales, relatives of Jacqueline Kennedy Onassis, will debut Saturday on HBO. I have only seen the 1975 documentary and I have to tell you that it does NOT disappoint. It's very much like watching a reality TV show set in the '70s except that with these ladies - although there is plenty of physical and mental destruction - do not seem as trashy as many of the best kept TV stars are today. I look forward to seeing the HBO version of their lives - my hope is that the network has done them justice. For a slideshow of the Beale ladies and the various people who have played them in the past, make sure to check out the NY Times slideshow.